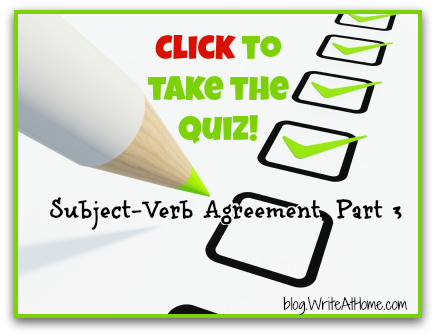 Home / Blog / Take the Subject-Verb Agreement, Part 3 Quiz! Warning! This quiz is tough. It’s based on my 3rd post on subject-verb agreement. We have waded into deeper grammatical waters here. In fact, I am still waffling on the answer to one of these questions. I am unable to convincingly defend the answer I just know in my gut to be right. See if you can guess which one that is. Generally, my quiz-takers do quite well. I have a smart bunch of readers. But I’m curious to see how folks do on this one. I have a funny feeling I’ll get some arguments about my answers, but other than that one I mentioned above, I’m confident I’ve got them right. If you disagree, please make your case in the reply section below. There’s no better way to really get a grasp of grammar than hashing out the tricky stuff. If you want to share your score or argue an answer, leave a comment below. “What I am hoping for” is a singular noun clause. That’s why the verb is singular. Is that an over simplification? That the subject complement is plural doesn’t matter. That begs the question of the explanation you gave above regarding “All I need…” I understood your explanation to be saying that because the predicate nominative was plural, the verb should be plural; however, I wrote “is” and was not marked incorrect. I’m excited! I scored a 100%. You must have done a good job of explaining all these rules in your previous posts. Thanks. I am always happy to take credit for your success, Mary! I only got 70%. (English major) But i really disagree with no. 8. Explain, please, thanks. The answer here is complicated by the restrictive “we need” clause that follows. Usually, “all” is followed by an of-phrase and we determine its number by looking at the object of the preposition “of”. If it’s a plural noun use the plural verb. If it’s a non-count noun, use the singular. The only way to determine the number of “all” when an expression like “all we need” or “all that we need” is to look at the predicate nominative on the other side of the verb. In this case, “All” is referring to “two toasters and a pair of binoculars,” a compound objects combined by “and” and therefore, plural. Now, there is an argument out there that the expression “all that we need” should always be followed by a singular verb, but I can’t find any logical or grammatical basis for that. Oh and is #7 “raise and promotion” the one you weren’t sure about. It was the one for me where I wasn’t sure, but the answer I put just sounded right. And it was correct. Yes, #7 is the one where I still can’t confidently defend what I know to be the right answer. Just for clarification about the tense of “to hang”, I see what you mean about it and even before I pushed publish on the comment I started to rethink “hang” being used in the past tense. I still, however, can’t shake the feeling that I’ve heard it used that way before like, “I walked closer and there hang the portrait.” Am I just going crazy or is this a word that gets misused a lot? Oh, and I did take this one w/o peeking at your post as well. I like doing it that way; it really tests what I know, not my “reading comprehension” so to speak. Maybe you could do some of your quizzes that way; post the quiz, then your explanatory post. Just a thought. 80%. But isn’t the plural of lie, lies?, unless your speaking in past tense, then it would be lays. The plural form of the NOUN “lie” is “lies,” (he told two lies), but the SINGULAR form of verbs is the one that ends in -s. You would say “the politician lies” (singular) and “the politicians lie” (plural). Well, I’m sure I’ve confused both you and JJ completely. I just went back and looked at question #10 on the quiz and I was incorrect about my use of lay/lays. It should have been lie/lies. I think that’s what you both were trying to tell me. Sorry. One of these days, I will post a quiz without any obvious errors. At least in this case it shouldn’t have affected the answer, since it was asking about agreement, not about the proper use of lie vs. lay. I only got 70%. I think however, the plural of lay should be lies instead of lays. Just a thought. Thank you! “Lay” and “lie” are two different verbs. They are not interchangeable. They have similar definitions, but “lay” is transitive–needing an object–and “lie” is intransitive. The singular of “lie” is “lies” and the singular of “lay” is “lays.” That’s just how it is. See my note to Grammar Nut, JJ. What I just said is true, but I think what you are getting at is that my choice of lay/lays in question #10 should have been lie/lies. And about that you would be correct.